The upcoming Lenovo L38111 smartphone has bagged certification from Bluetooth SIG body and it comes with 18W fast charging support. In the recent past, the smartphone has bagged various certifications in China such as CCC, CMIIT and TENAA. The exact identity of the smartphone is still under the wraps. 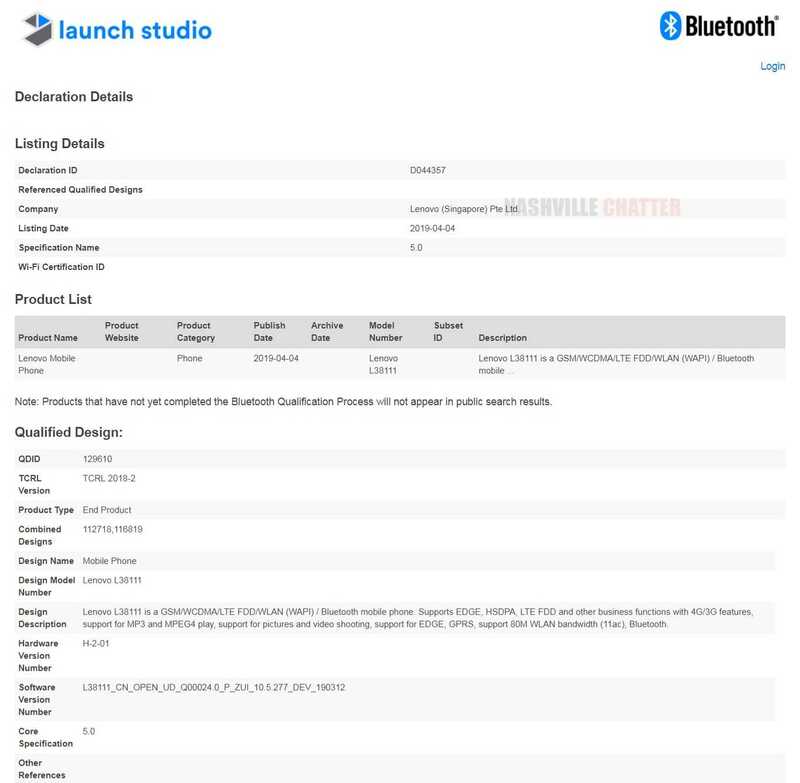 The Lenovo L38111 Bluetooth SIG listing only confirms that the phone carries support for Bluetooth 5.0 and Wi-Fi 802.11ac. The 3C certification of the phone had revealed that the phone carries support for 18W fast charging. These specs indicate that it could be a mid-range or high-end phone from the company. In 2018, Lenovo had couple of K-series smartphones. A quick check on their model numbers reveal that they all begin with “L380.” Hence, there is a possibility that the newly spotted Lenovo L38111 could be an upcoming K-series phone. Among the aforementioned devices, the Lenovo K5, K5 Note and K5 Play were announced in the second quarter of the year. Among these phones, the Lenovo K5 Note bears better specs. Hence, the L83111 could be arriving as its successor and may debut as Lenovo K6 Note (2019). Since it is just a calculated guess, readers are required to digest it with a grain of salt. It is advisable to wait for further reports on Lenovo L38111 to confirm on its identity. The Lenovo K5 Note (2018) features a 6-inch HD+ display that supports 18:9 aspect ratio. The MediaTek MT675V SoC powers the phone with 3 GB of RAM. It has an internal storage of 32 GB. For photography, it is equipped with 13-megapixel + 5-megapixel dual camera module and a 5-megapixel selfie snapper It houses a 3,000mAh battery.